Cat water fountains have become more popular over the last few years. Why do you ask? Well, people have become to realise the benefits to their cats’ health to keep them well hydrated. Therefore, water fountains are an excellent means to help persuade your cat to drink more. 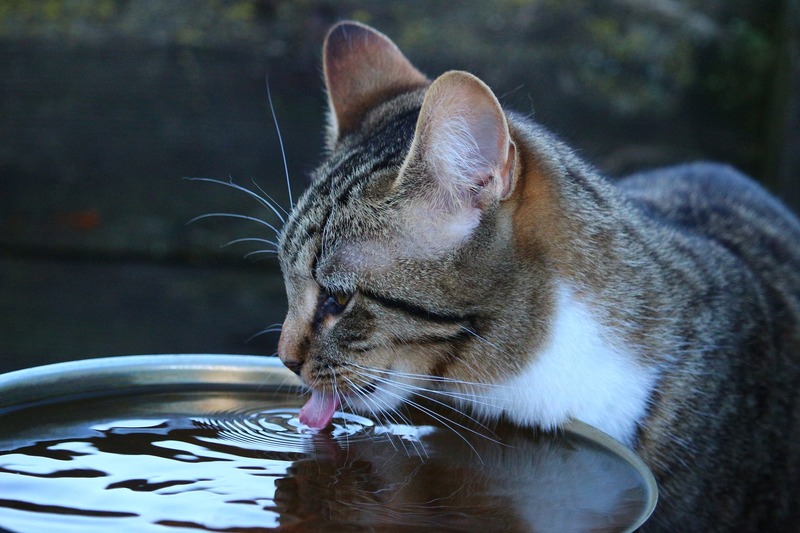 Not drinking enough water can make your cat dehydrated. And cats are not very good at regulating how much water they should drink especially if they eat only dried food. Some of the health issues that can occur from lack of water include kidney and urinary tract diseases. Cats enjoy running water. Have you ever seen your cat drinking from a tap? If so then you will relate to this. Cat fountains simulate this moving water. They will also have filters to filter out debris and hair so the water is fresher and not stale or stagnant. As the water is constantly moving this means it will also be more oxygenated and cooler. Water fountains come in three types of materials – plastics, ceramic and stainless steel. Plastic fountains are usually slightly cheaper, so a good start or useful if you are on a budget. Ceramic and stainless steel fountains can be more hygienic as they do not get as scratched as plastic ones can. When a water bowl gets scratched this can encourage bacteria to grow. 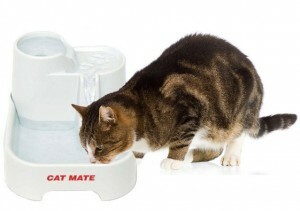 The Cat Mate Pet Fountain is a classic water fountain that has been a best seller for a number of years. It is made of a sturdy plastic and holds around 70 fl oz (2 litres) of water. It consists of three levels thus allowing kitty to choose the best place they wish to drink from. This water fountain is a brilliant price and is easy to clean and dishwater safe. Scoring 9.1 out of 10 in our review this is a great buy and a good starter fountain. Click here to read our indepth review of the Cat Mate Pet Fountain. An unusual design made the CatIt Fresh & Clear Drinking Fountain an instant hit with a multi cat household. The curved dome meant that cats (and even dogs) could drink from anywhere they chose. With a larger than average capacity of 100 fl oz (3 litres) this meant that the fountain needs filling less often. 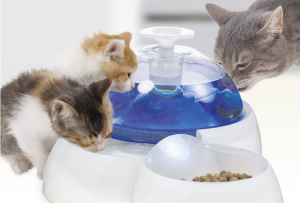 Made from plastic, it also has a detachable food bowl and comes with a highly useful protector for the power cord. In our review this fountain scored a good 8.5 out of 10 and at a good price this might be another excellent purchase for you. Our Review of the CatIt Fresh & Clear Water Fountain is here. CatIt have now come up with another cool and innovative looking water fountain. 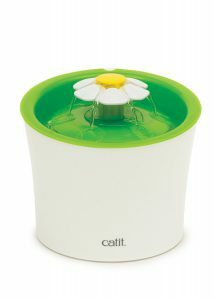 The CatIt Flower Fountain stores 100 fl oz (3 litres) of water and has 3 flow speeds. With its’ interesting bucket shape and “flower and bud” water spout feature this water fountain will also look very good in any home. We loved the look of this fountain as well as the multiple types of water spout and the ease of cleanup. The price also got a big paws up from us. Our one negative was that this fountain will not have accessible water if there is a power outage. This fountain scored 9 out of 10 in our review. See more of our CatIt Flower Fountain Review Here. The Cats Rule Frog Watering Hole is a very fun and quirky design with its’ frog perched on top of the water bowls. 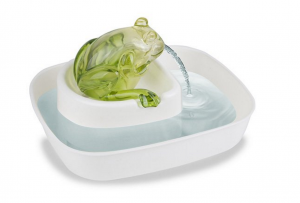 The water bowl is made from polypropylene and the frog is made from a food safe resin. Whilst it works well it does seem like more of a novelty item. It will definitely be a talking point with visitors. Capacity is smaller than average at 1.2 quarts (1.14 litres) so needs regular filling. It could be a good gift for a cat mad friend. We reviewed the Cats Rule Frog Watering Hole Here and gave this a 7.5 out of 10. The Pioneer Pet Stainless Steel Fountain Raindrop Design is a bit of a mouthful to say. However, this is a sleek, smart design in stainless steel. This makes it very easy to clean and it keeps bacteria and algae at bay. It also cuts down cat acne. With a capacity of 60 oz (1.77 litres), it does not store the most water. It also needs to be topped up daily. But it does allow drinking from three areas – the top, the water channel and the base bowl. You do get the sound of bubbling water with this fountain and the pump does make a slight humming sound but it is pretty minimal. Our comprehensive review gave this a 9 out of 10 and you can read all the information here.